Remember when the rumors were swirling that Vice President Mike Pence was going to be campaigning for Republican John Marino in the special election in the 10th Senate District to replace the now Lt. Governor Bethany Hall Long. Well it turns out that a Vice President did show up. Vice President Joe Biden. 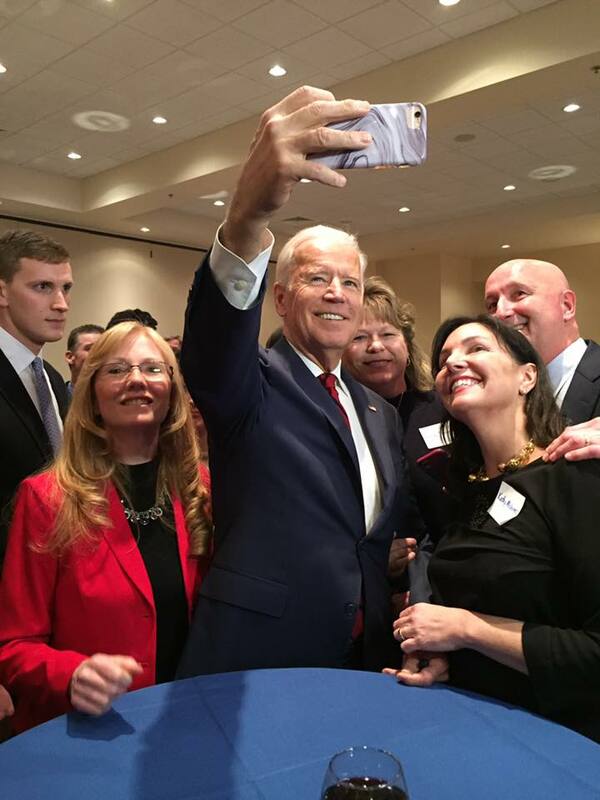 Biden campaigned for Democratic candidate Stephanie Hansen last night at a fundraiser in South Newark last night. Hansen and the Democrats clearly have the momentum in this race, as they have successfully translated the anti-Trump feeling in the Democratic Party into support for her. Her campaign and the PAC supporting her, First State Strong, have raised a good amount of money to be competitive in this race. Friends of Hansen (Hansen’s campaign organization) reported $81,107.00 in receipts as of January 20, 2017, though the campaign has surely raised much more than that since several fundraisers have held since then. The PAC, First State Strong, has spent $186,000, according to the News Journal. The PAC’s existence has drawn the hypocritical fire of GOP Chairman Charlie Copeland and John Marino, who allege that the PAC and the Hansen campaign are improperly coordinating their activities. Without any evidence to back up his allegations, Copeland has filed a complaint with the Commissioner of Elections. I suspect Copeland’s complaint will either be quietly withdrawn or tossed after the election. Copeland and Marino are just upset that their rumors of a Pence visit have not come to fruition. And that old rule still applies: if you are complaining to the refs, you are losing. And DL reported yesterday that Marino’s campaign manager and volunteer coordinator hate-quit the campaign. Here is the link: http://www.delawareliberal.net/2017/02/13/breaking-team-marino-in-turmoil/ Thanks Geek. I missed that.